If you looked at the title and thought "Chillsner? Sounds kinda like pilsner." then you're on the right track. 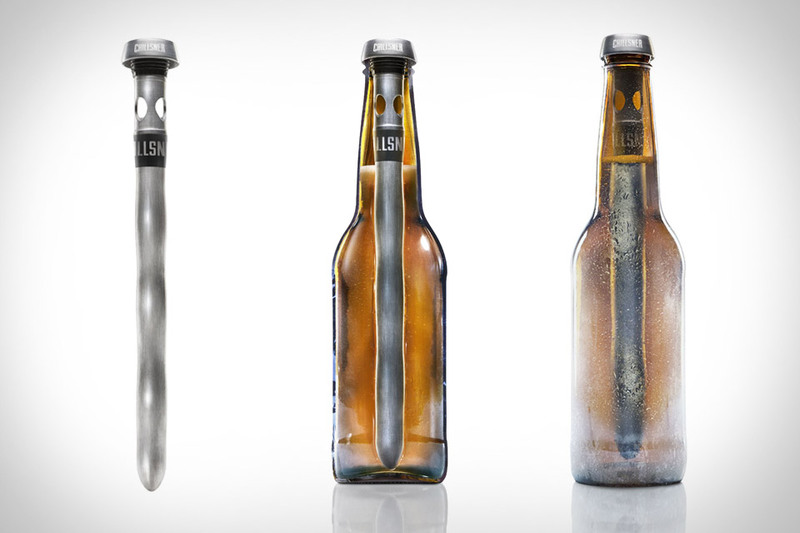 The Chillsner ($30) is a new beer-chilling gadget that promises to keep your drink cold from the first beer to the last. To use it, you simply throw it in the freezer, and once it's good and cold, crack open your beer and put it down inside. Thanks to openings in the top, you can drink straight through it, or use it to chill your beer as you pour it into your favorite mug. Either way, it sure beats watering down your suds with ice. There's an old adage that says you should never drink alone. With the Sasquatch Cocktail Shaker ($50), that shouldn't be a problem. This massive 110 oz. shaker is made from food-grade stainless steel, stands over 15" tall, and features a built-in strainer. Considering that 110 oz. is enough to make oversized drinks for over ten people, you'd better not be caught drinking alone with this thing — or people will think you're the one with the problem. Sure, the DraughtKeg is handy, but it's also a little messy, and takes up quite a bit of room in the fridge. The BeerTender ($135) solves these problems by serving as a standalone beer-serving machine, made especially for the 5L DraughtKeg. Co-developed by Krups and Heineken, the BeerTender features integrated refrigeration to keep your beer at the ideal temperature of 37.4º F, and the built-in display lets you know when it's time to refill. Plus, with its advanced pressure system, you'll get the perfect pour every time.